BRISTOL, Tenn.—So what else is new? Kyle Busch hit another milestone in Saturday’s Scotts EZ Seed 300 at Bristol Motor Speedway. Yes, he won the race. That’s almost a given in the NASCAR Nationwide Series these days. The victory was Busch’s second of the year and the 45th of his career, leaving him four behind Mark Martin (idle Saturday) for the career lead. Perhaps even more impressive was what Busch accomplished on Lap 265 of 300. 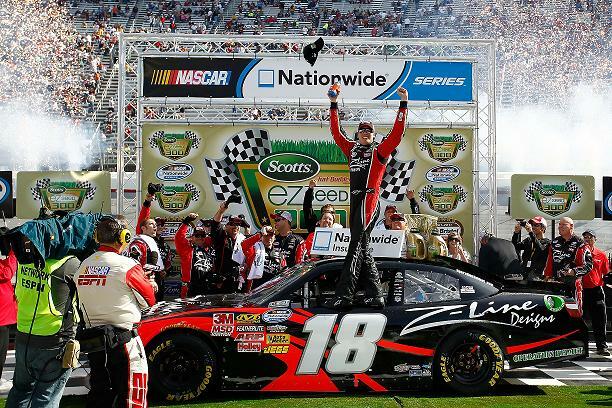 In his 206th start, Busch, the 2009 series champion, led his 10,000th lap in the series. No one else is close. Busch, who swept the Bristol weekend in August, is the first back-to-back winner at the track since 1993 series champ Steve Grissom in 1995. Fast-closing Kasey Kahne finished second, .524 seconds behind Busch, followed by two-time series champion Dale Earnhardt Jr., Elliott Sadler — the higheset-finishing driver championship contender — and Joey Logano. Danica Patrick finished 33rd after wrecking late in her Bristol debut. Busch took the lead from Earnhardt moments after a restart on Lap 32 and held it the rest of the way, with the exception of one lap led by Kahne under caution and two led by Brad Keselowski, who won the series title last year. Nevertheless, Saturday’s win wasn’t exactly a walk in the park. Under a competition caution called after Lap 25, teams were required to replace their right-side tires with a new construction rushed to the track by Goodyear after tire wear issues plagued Friday’s practice sessions. The new tires affected the handling of Busch’s No. 18 Toyota. “It changed the dynamic of the car quite a bit,” Busch said. “We had to compensate for that driving-style-wise and with some changes to the car, but (crew chief) Jason (Ratcliffe) and these guys did such a great job. On Lap 248 Danica Patrick’s Chevrolet tangled with the Toyota of Ryan Truex, spun and slammed nose-first into the Turn 1 wall. Patrick, who was running two laps down in 17th at the time, thought Truex moved off the frontstretch wall into her racing line. Jason Leffler finished eighth and took over the points lead by two over polesitter Ricky Stenhouse Jr., who finished 14th. Next Story → Where Will Kyle Busch Rank In History When All Is Said And Done?